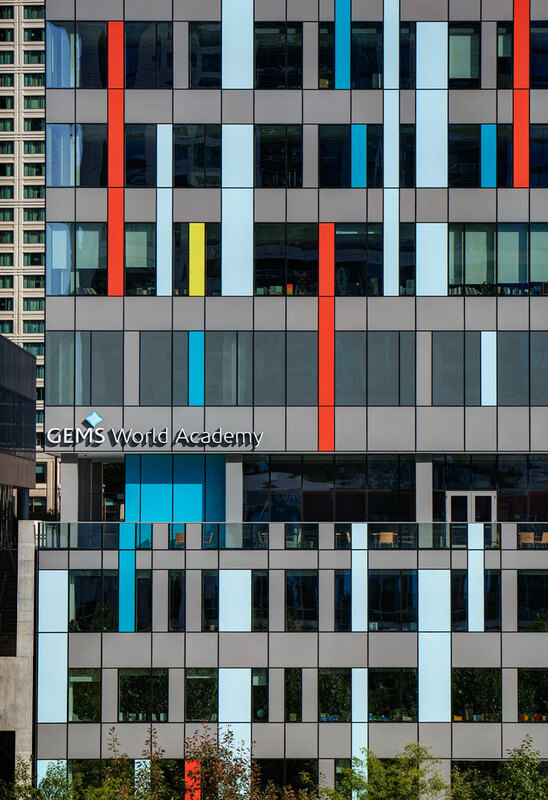 GEMS World Academy is a private K–12 school in Chicago’s Lakeshore East Community. 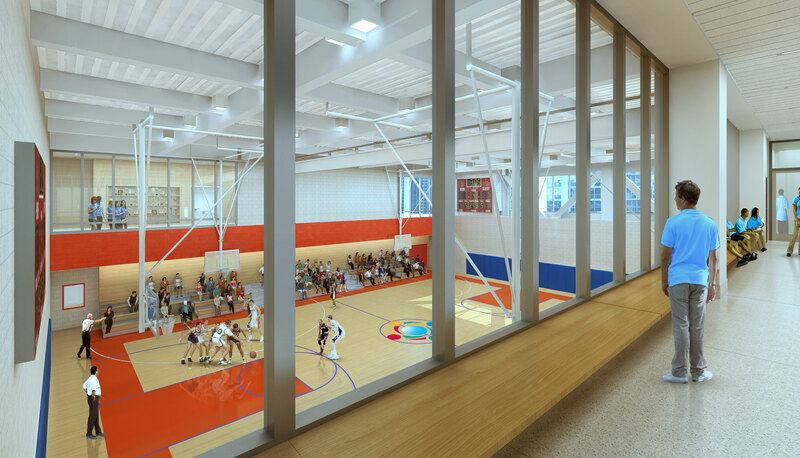 The two-building vertical campus marries GEMS’ program with local requirements, creating a new model for a high-rise school in an arena of limited precedents. 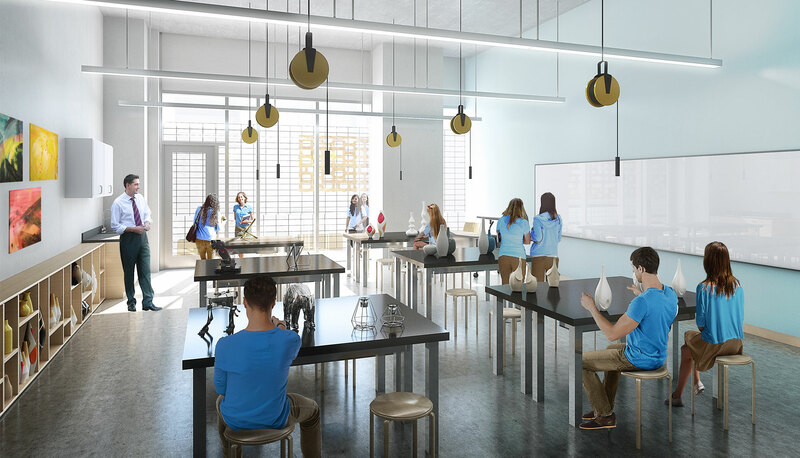 The use of state-of-the art technology enables students to collaborate with classrooms throughout the world, providing an international perspective on education. 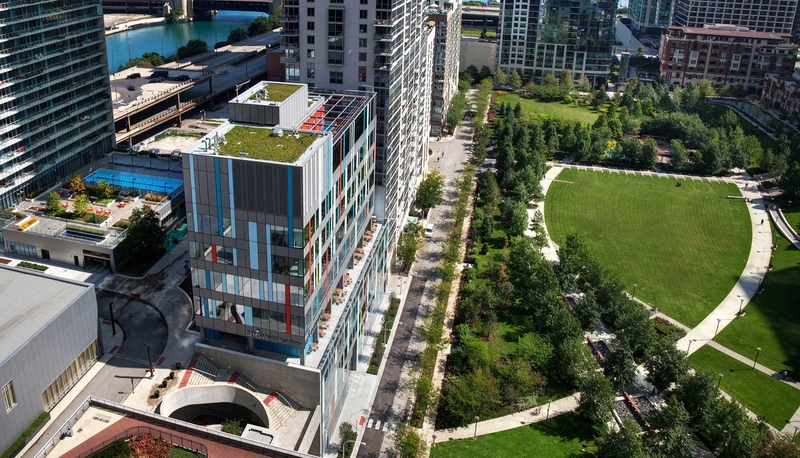 The Lower School houses 660 students within 10 stories on a limited site. 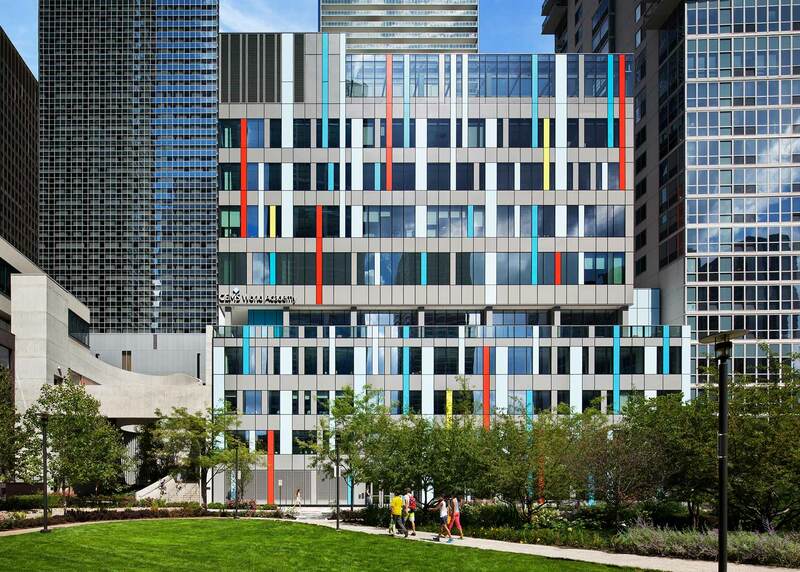 Juxtaposed against an adjacent park, the playful exterior is a modernist composition of interlacing colored panels and glass. 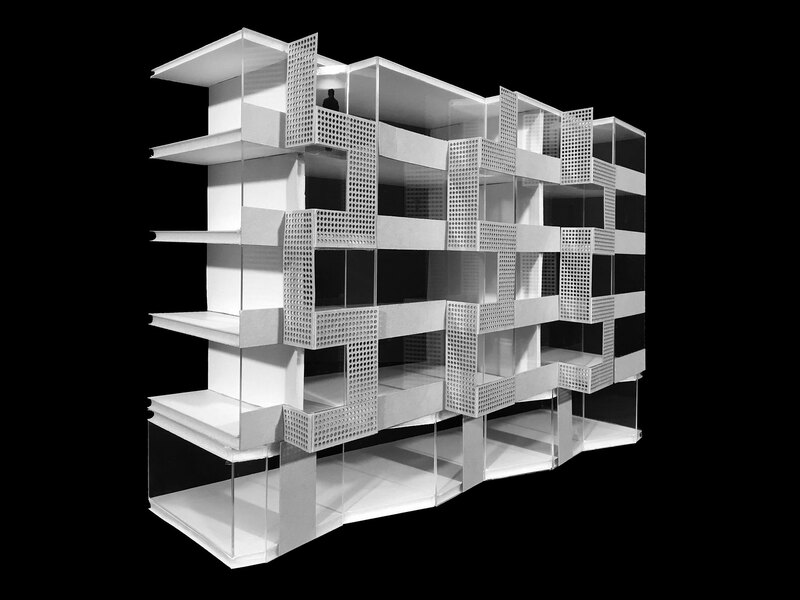 The configuration responds to internal program elements while rationalizing the construction, allowing for fast-paced fabrication. 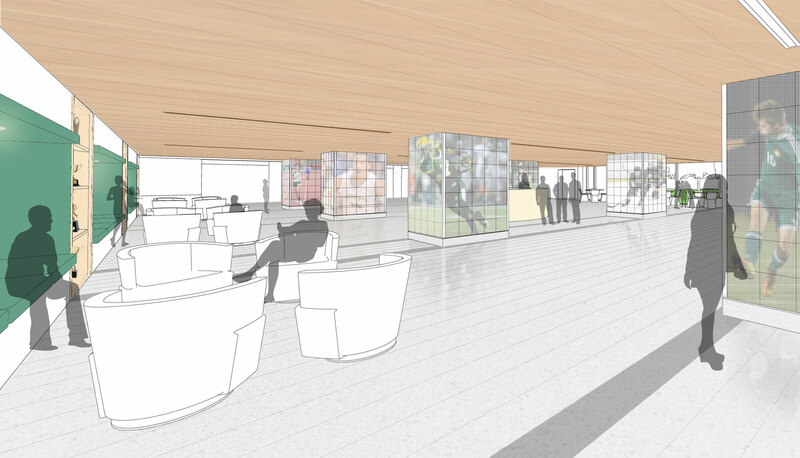 Organized to reduce travel times, the common areas are stacked centrally. 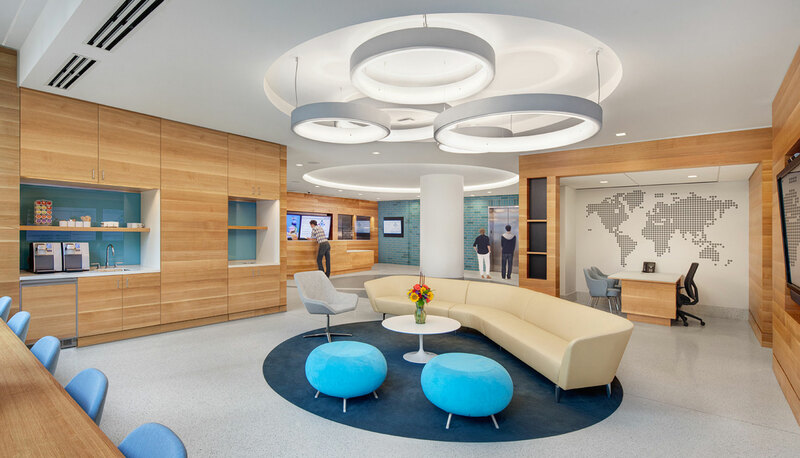 Interior architecture is driven by flexibility, optimized floor area, connectivity, daylight and views. 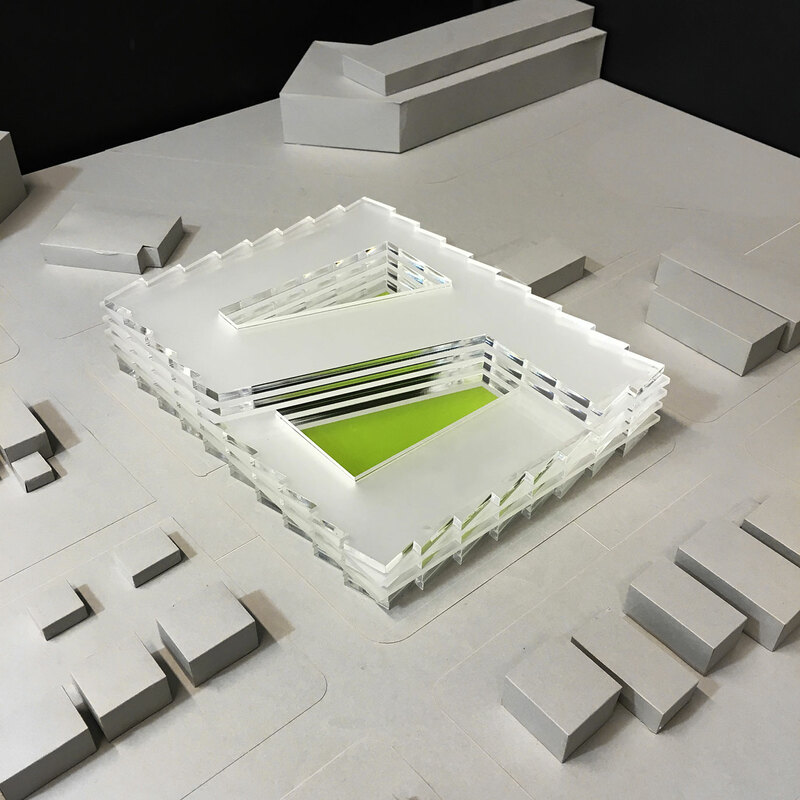 The design responds to the unique site constraints, provides a variety of spatial experiences, and makes strategic use of color and materials while maintaining a consistent approach to detailing. 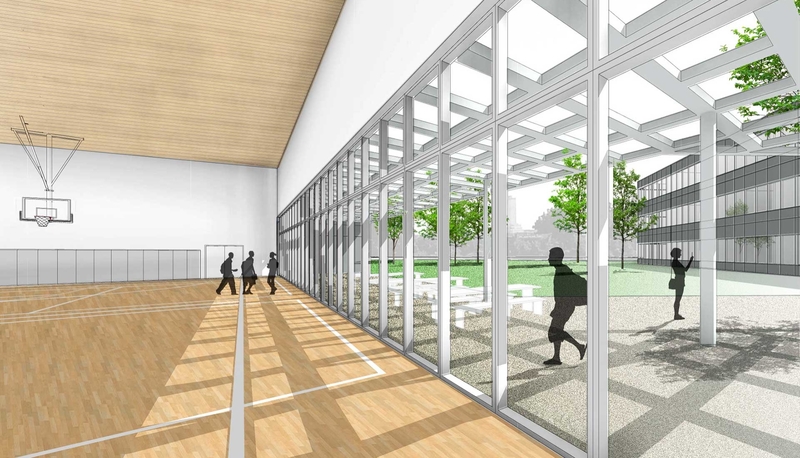 The Lower School facility has been planned in conjunction with an Upper School that is to be constructed in a future phase. 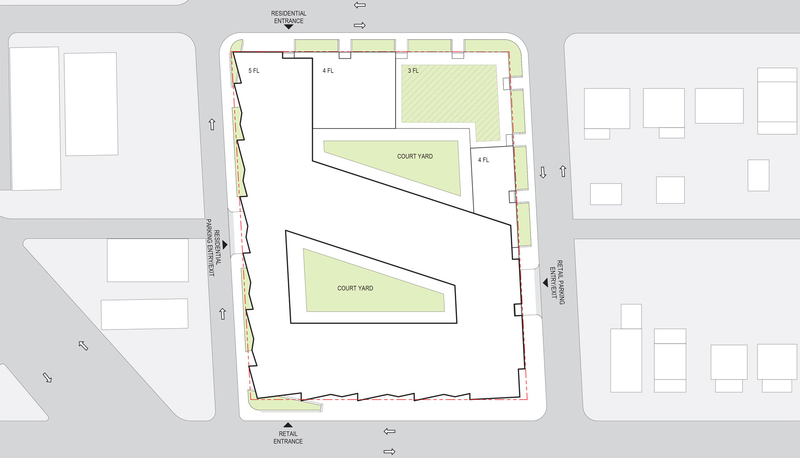 Distribution of grade levels and spaces between the two separate but proximate sites was determined during the master planning process. 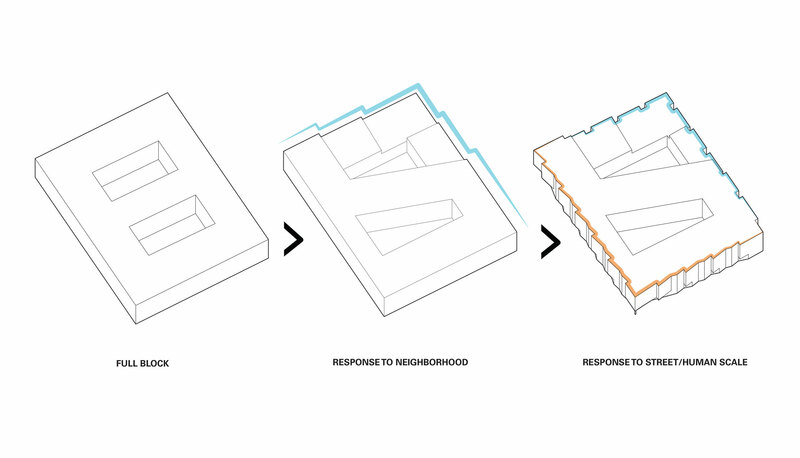 The two buildings, planned to serve a total of 2,100 students, maintain a unified approach to interior and exterior design, make provisions for internal drop offs to limit street traffic, and assist in stitching together the neighborhood by filling two vacant sites. 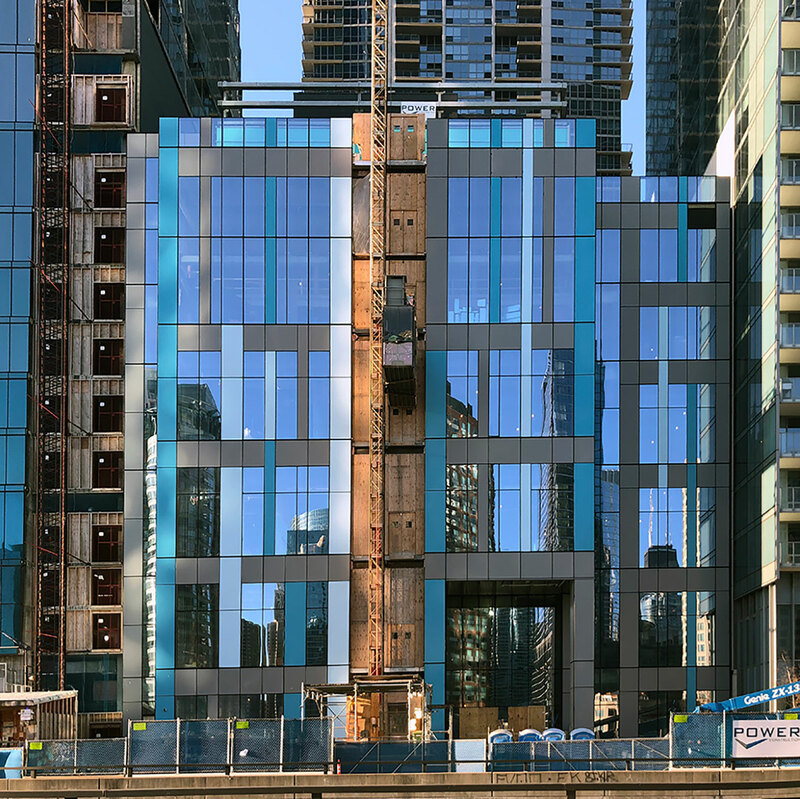 The Middle-Upper School, to be located on Wacker Drive, will house 1,440 students and overlook the Chicago River and Lake Michigan. 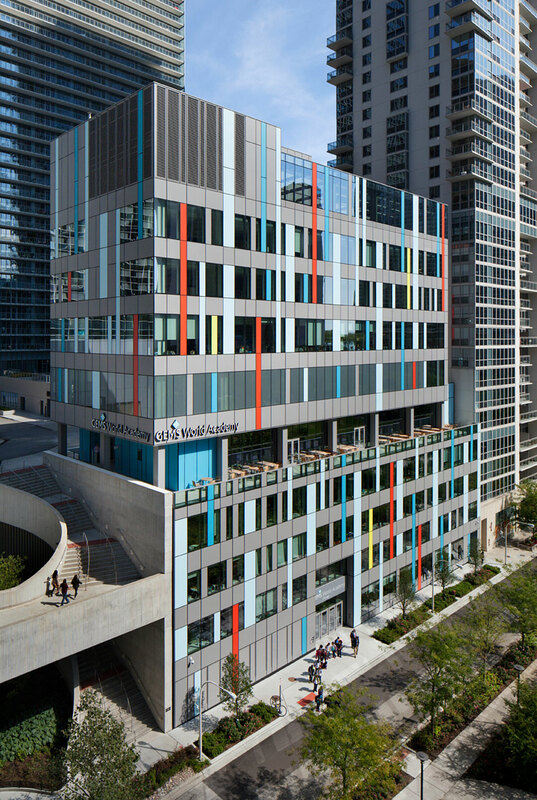 To address the challenges and opportunities of this unique urban location, the Middle-Upper School was developed in conjunction with the Lower School during a master planning process. 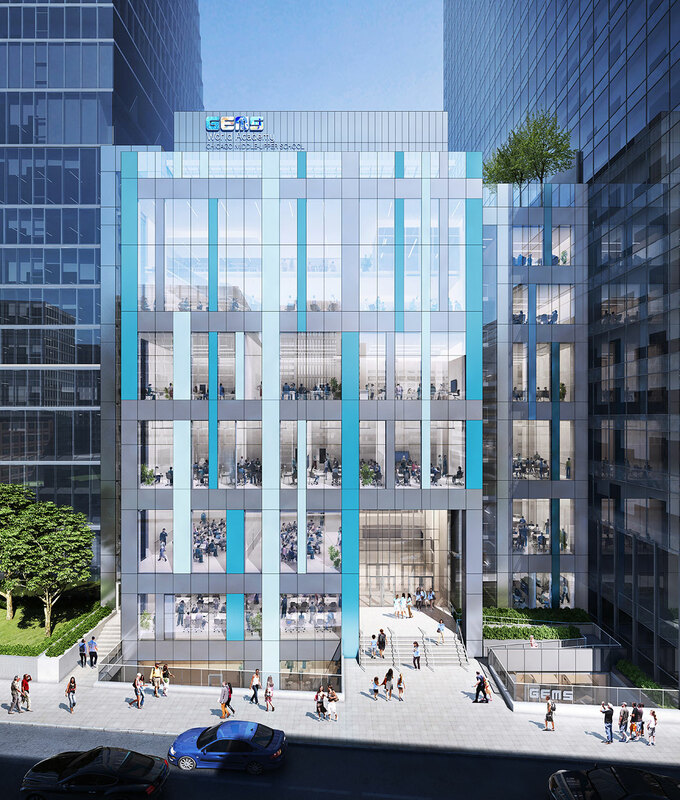 The resulting 2,100 student campus utilizes a unified palette of materials for the interior and exterior design and sets a precedent for exceptional architectural standards as GEMS enters the U.S. market. 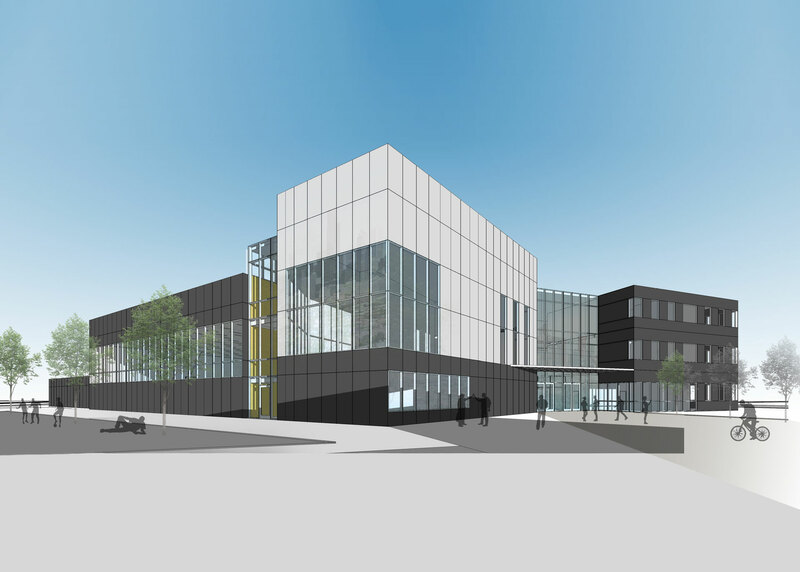 The Middle-Upper School building incorporates an internal drop off and two levels of parking. 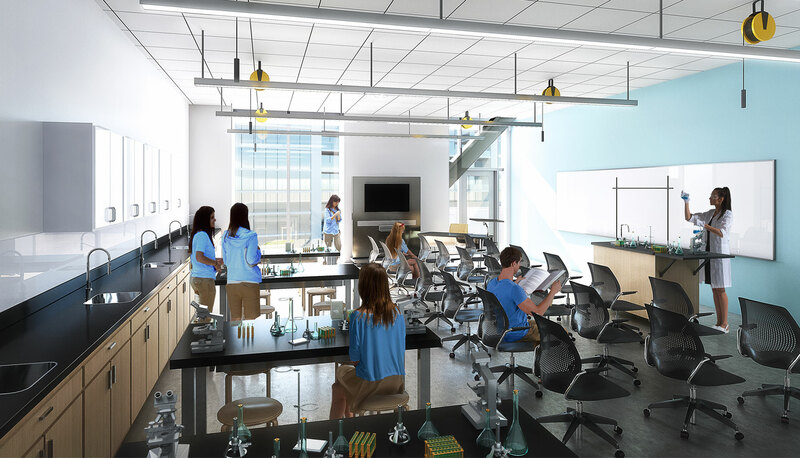 Common spaces are primarily located at the base of the building to facilitate events, while dedicated learning spaces are placed at the top, maximizing natural light and views and limiting travel times between classes. 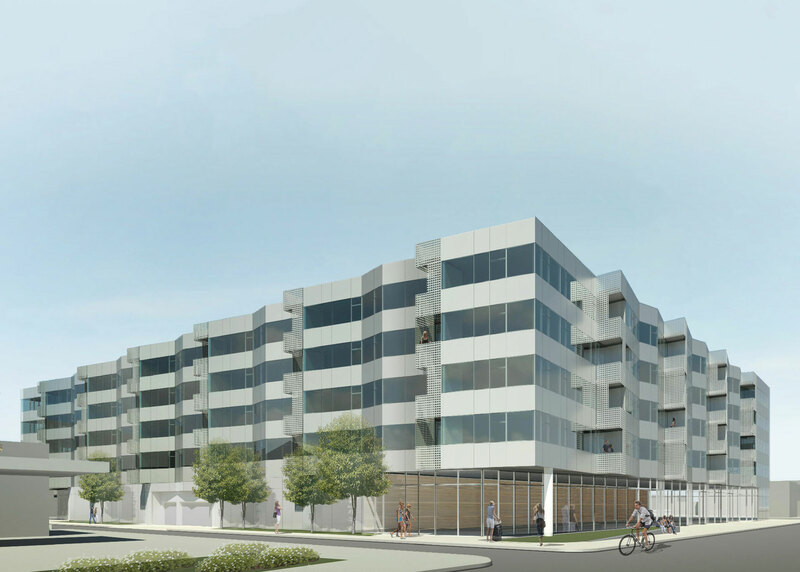 The integrated approach to sustainability includes cooling from a local existing district plant, eliminating the need for a chiller in either building. 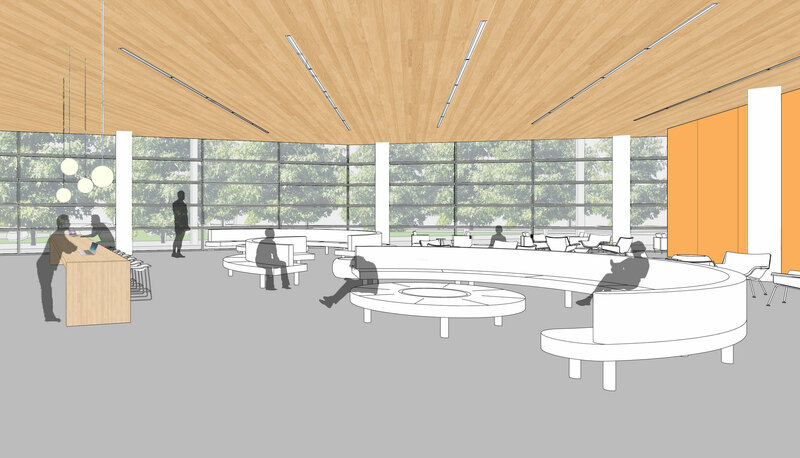 With this system in place, the area dedicated to mechanical functions is reduced, enabling more usable program area across the campus. 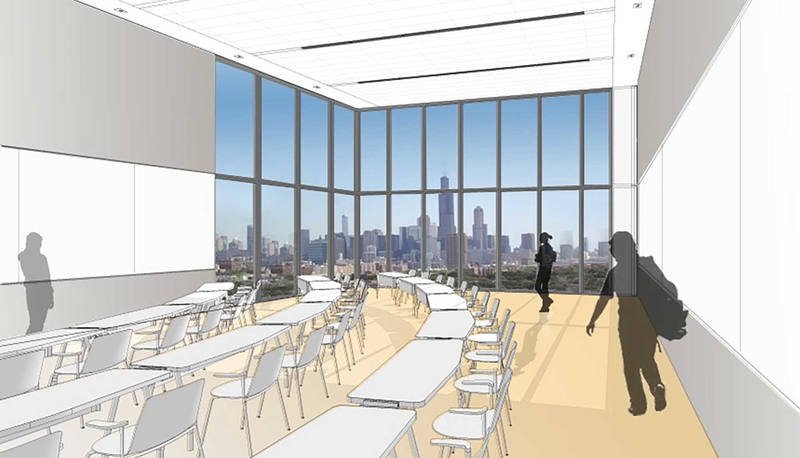 bKL was invited to prepare a conceptual design for a new urban charter high school serving 1,000 students. The goals addressed innovation, efficiency of circulation, and limited budget. 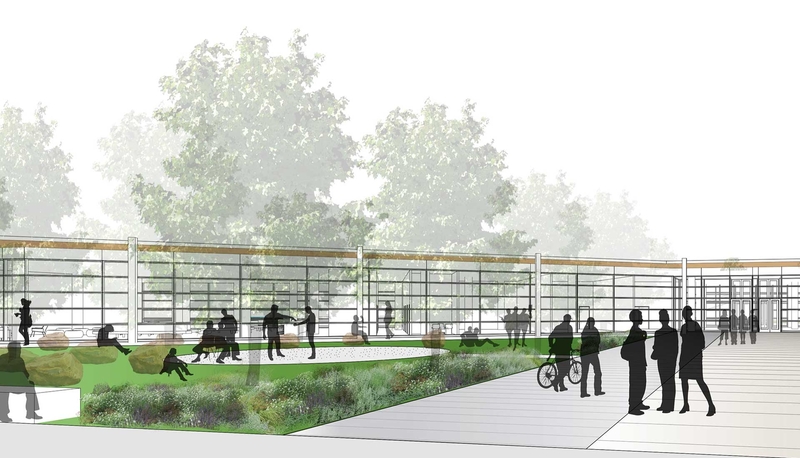 The design is composed of forms arranged to define and distinguish the elements of the school’s program. 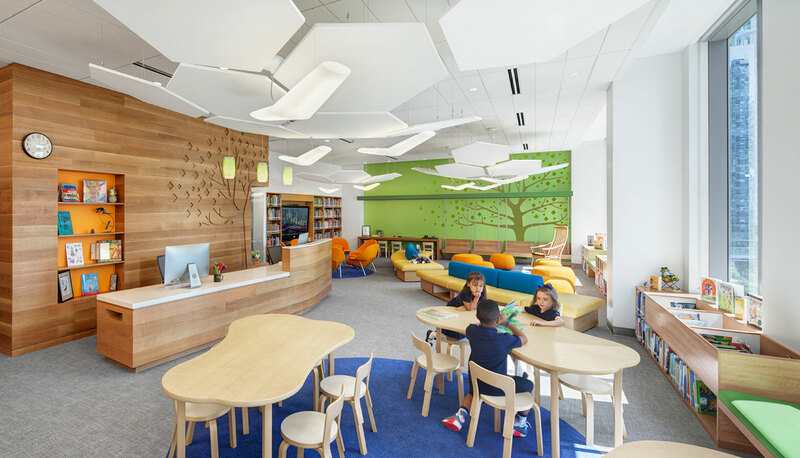 The building’s functions are organized into two highly efficient wings, separating the quieter focused learning areas from the louder social space. The strategy for organization of circulation and spaces anticipates adjustments to programmatic elements as the design evolves. 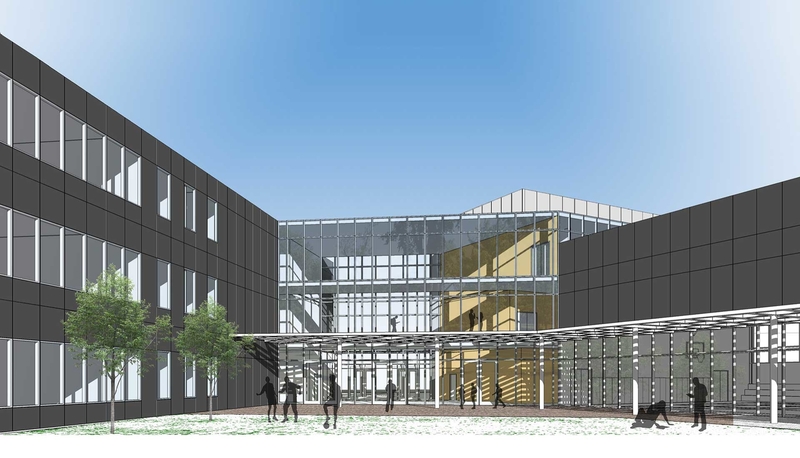 The program was constrained to standard classrooms, science labs, a lecture hall, a combined gym/cafeteria space, administrative and support spaces. 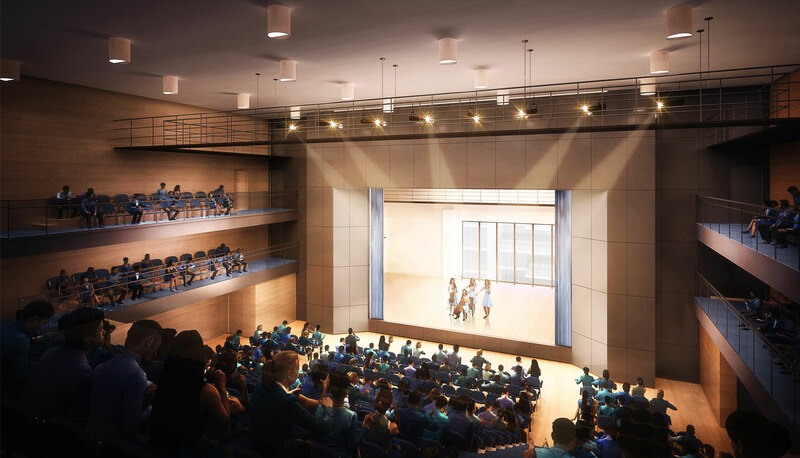 As specialty spaces were not part of the requirements, the lecture hall was developed as an aspirational and multi-functional destination, simulating a sophisticated, flexible space of a collegiate environment and highlighted from outside with a distinct façade and window expression. 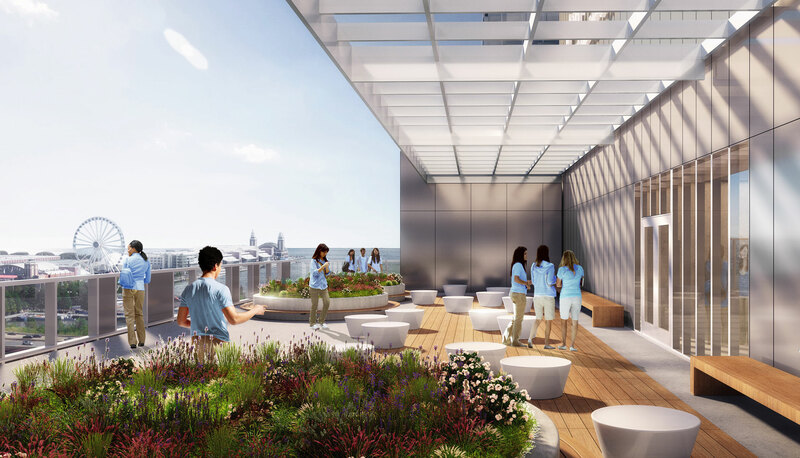 Maximizing the indoor-outdoor relationship, the central courtyard is bathed in sun and shielded from prevailing winds. 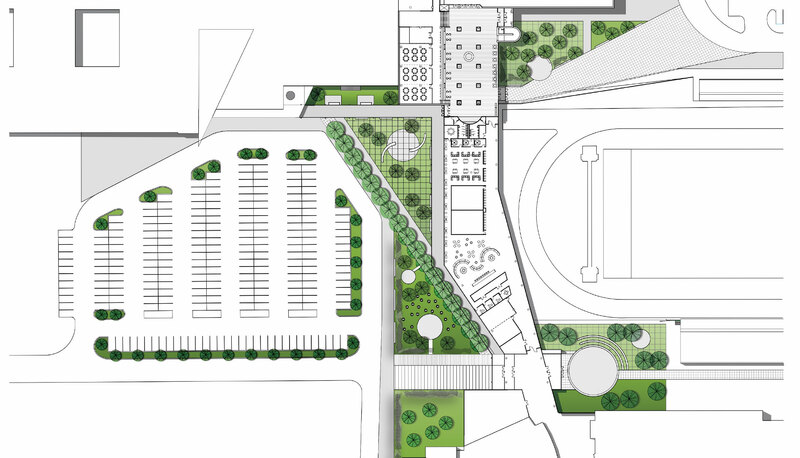 The courtyard adds opportunities for study, play, meeting and dining, performances and community events and creates a dynamic haven that is activated by students without adding interior built area. 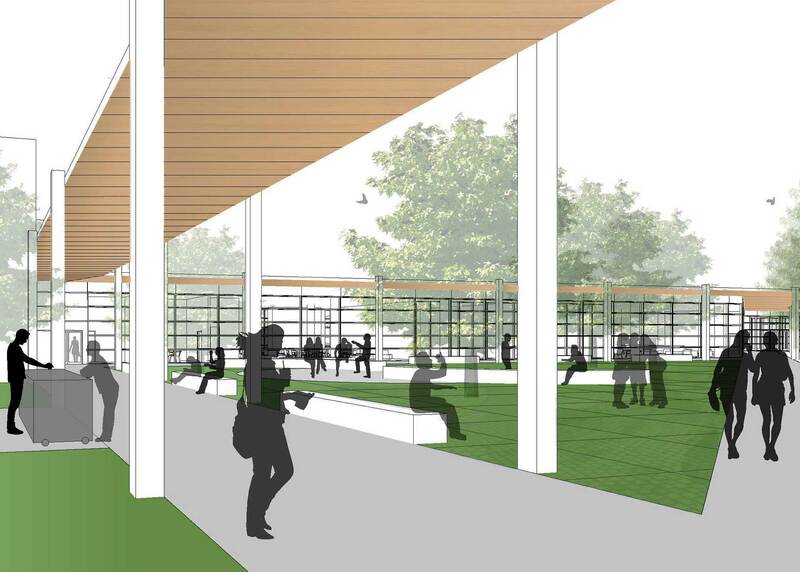 Student amenities for this existing facility are enhanced through the creation and expansion of informal and formal gathering spaces, tying the campus together in a cohesive manner. 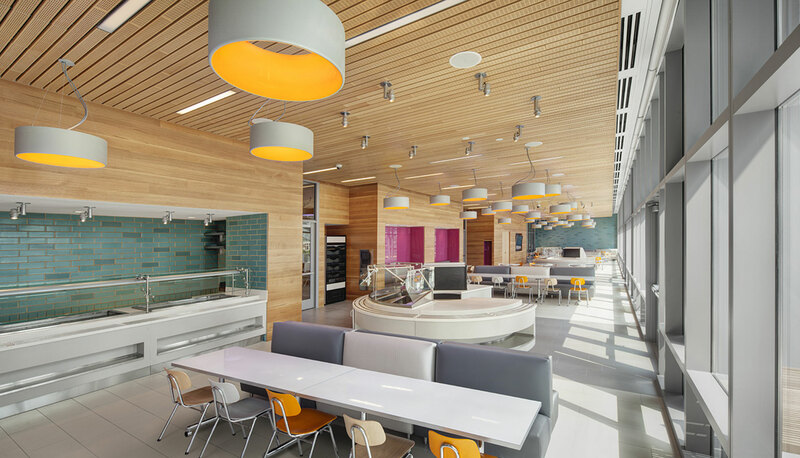 A new addition and the remodeling of existing interior and exterior spaces improves circulation and provides a unifying visual vocabulary. 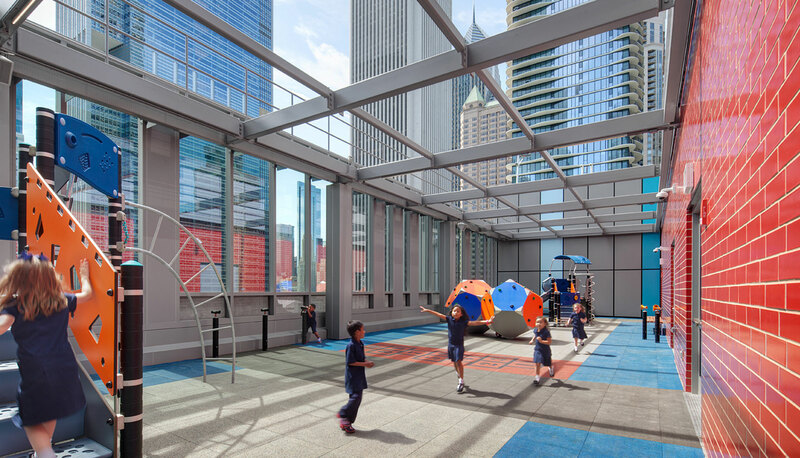 Outdoor classrooms are in clearly defined zones, supporting learning, gathering and outdoor dining. 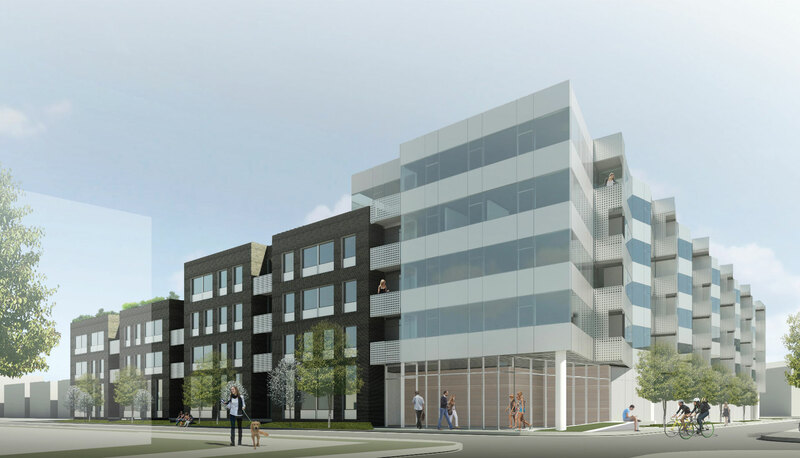 Site redevelopment addresses current student behavioral patterns and provides a direct and safe path of travel between three building entrances. 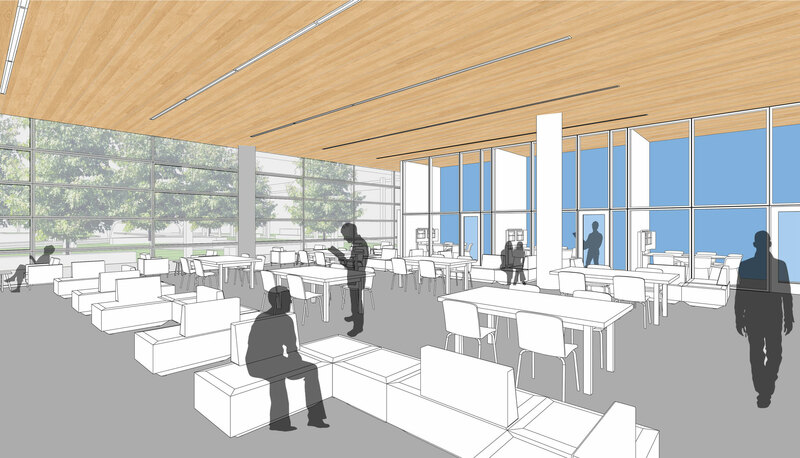 The Digital Information Learning Center (DILC) is a centralized hub envisioned to address student needs for study, interaction and technical support, while enhancing the connection between the two sides of campus. 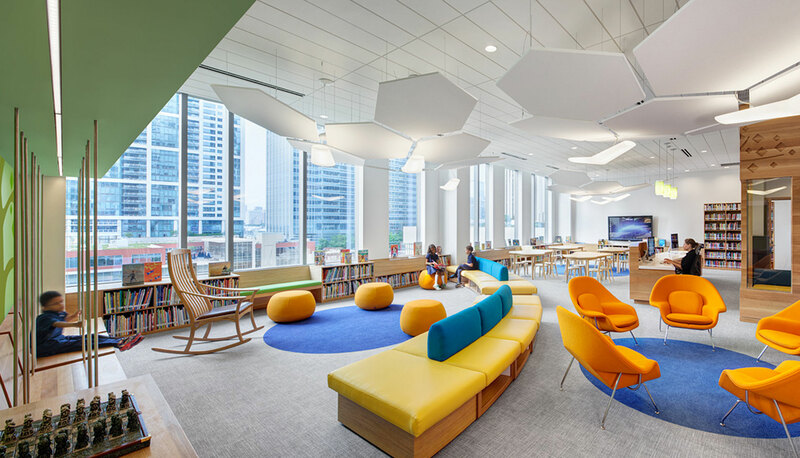 Spaces are organized as “oases” enabling flexibility of circulation and activities around tech support, offices, classrooms and quiet and collaborative study areas. 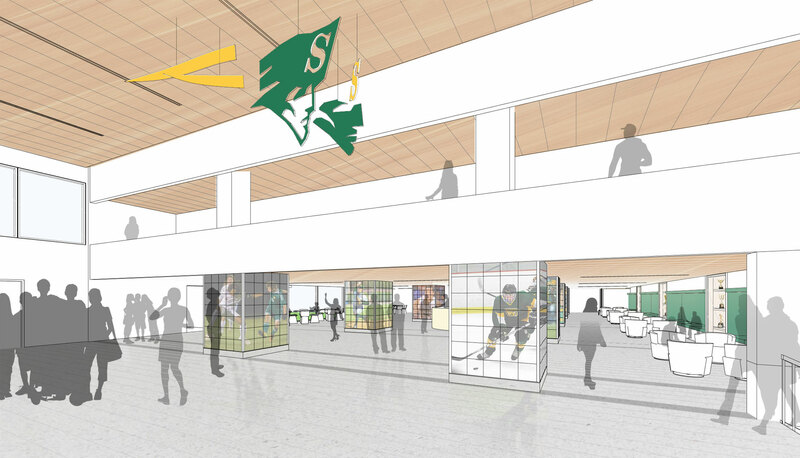 An expanded sports lobby creates one contiguous “Hall of Fame” connecting the competition Gym, the DILC and exterior spaces. 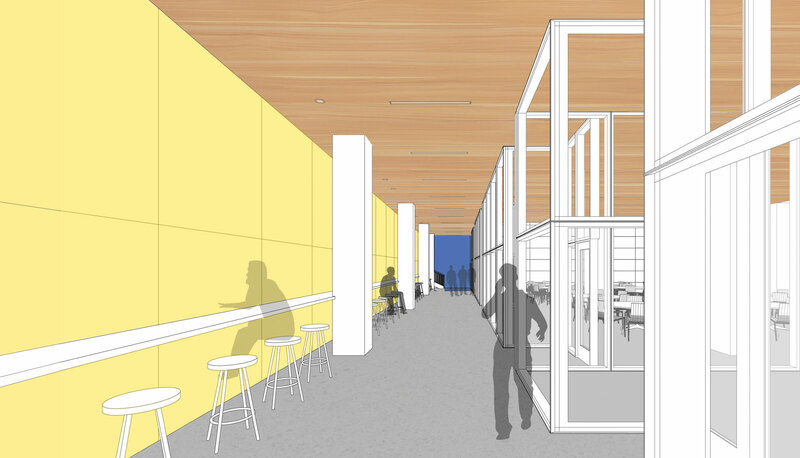 At the lower level, the faculty dining room has been reconceived as one large meeting room that can be subdivided into three spaces to accommodate student activities. 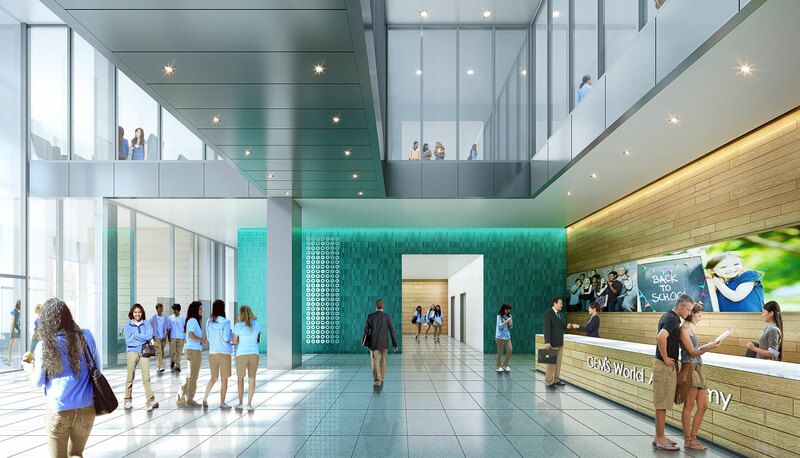 The new corridor, equipped with a work surface, links the space to both ends of the sports lobby and further improves internal circulation from one end of the building to the other. 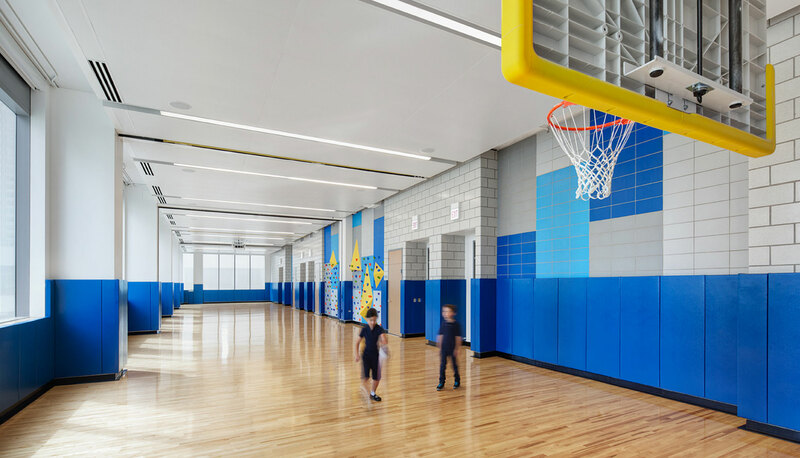 bKL completed three fast-track projects that were critical to ensuring welcoming environments for Chicago Public Schools students upon the start of the school year. 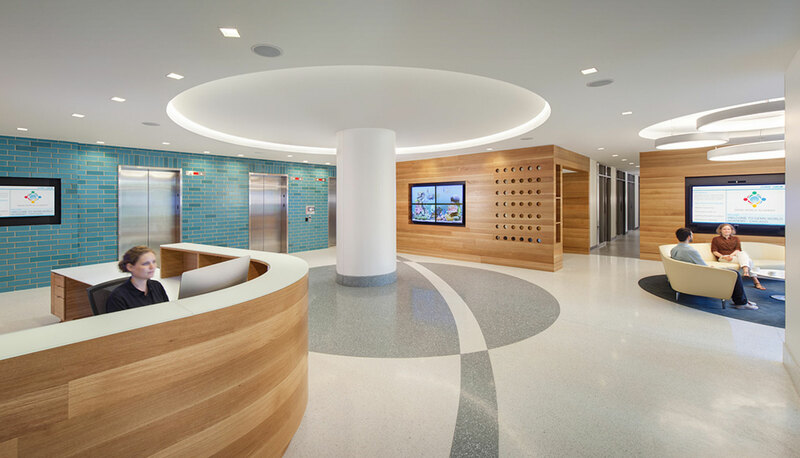 All three projects had the same schedules, with design and construction occurring within a limited time frame of 10 total weeks. 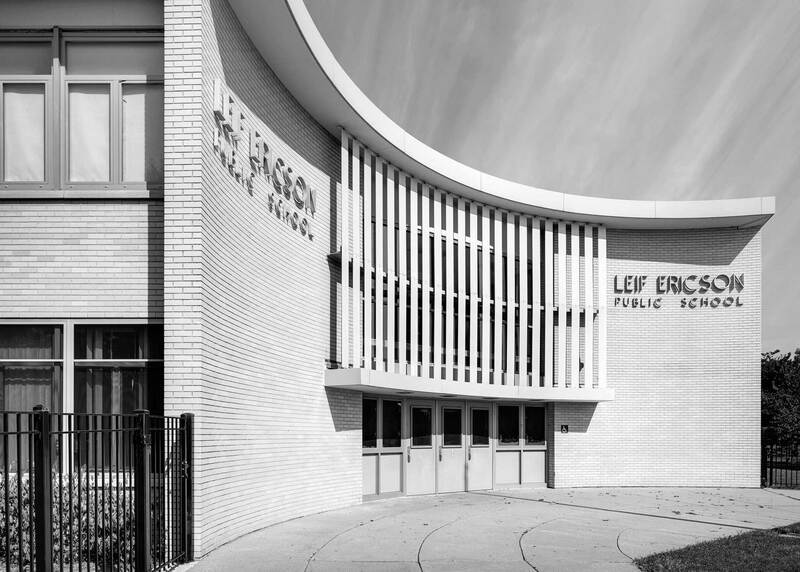 A variety of interior and exterior renovations were provided for Leif Ericson, Oscar DePriest, and Kellman Corporate Community elementary schools. 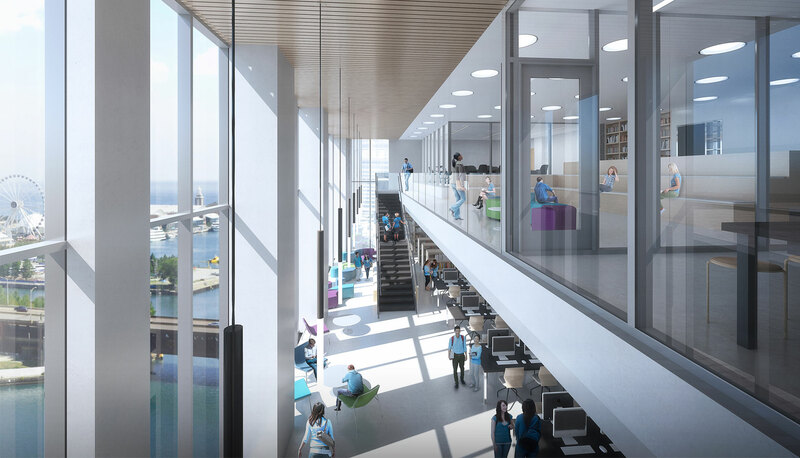 These included classroom, auditorium, library, dining, corridor and toilet room renovations, as well as the remodeling of exterior entrance access routes. 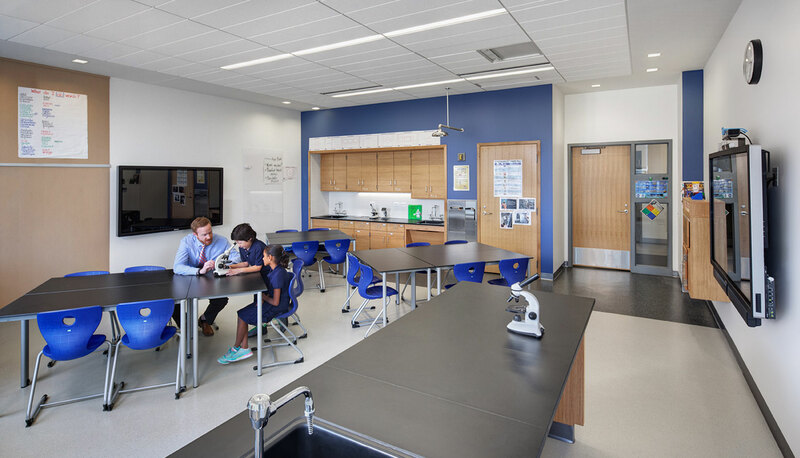 In addition to aesthetic improvements, provisions were made for air conditioning and wireless access points in compliance with the CPS mission to enhance technology and provide climate controlled learning environments. 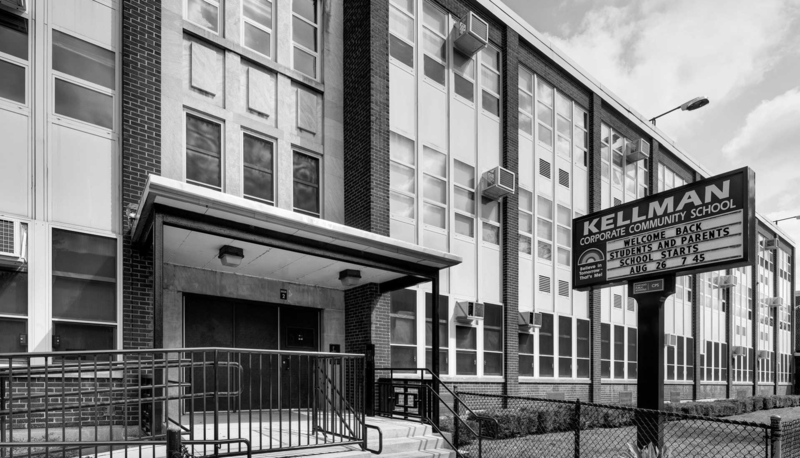 bKL facilitated fast track summer renovations for the Stephen F. Gale Math and Science Academy’s two building campus serving 370 students in PK-8th grades. 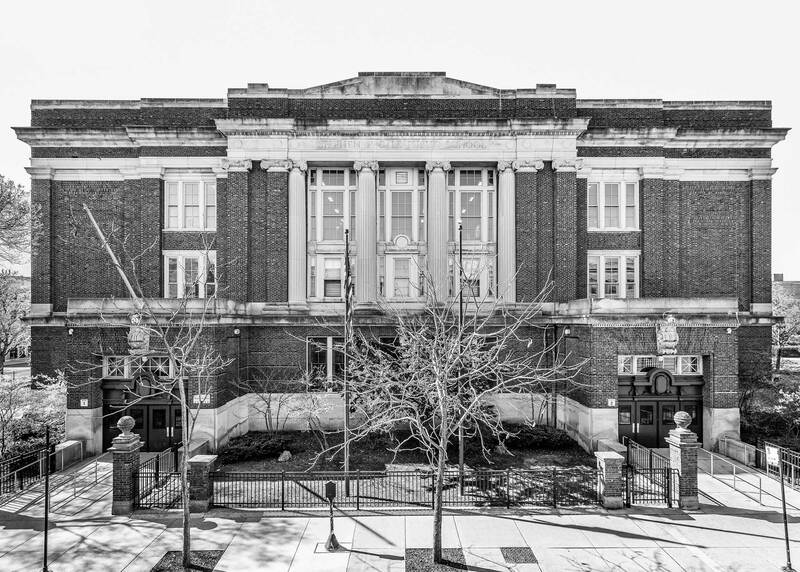 Renovations to the Main Building, originally built in 1922, included remodeling of the building’s 4 main entrances to provide ADA accessible approaches, replace doors and modify vestibules. 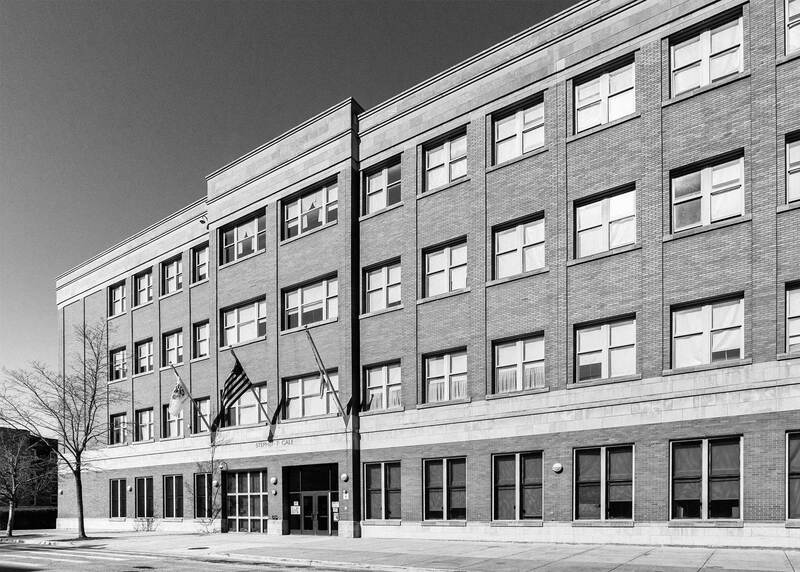 Extensive parapet reconstruction and roofing repairs were also completed across 29,000 s.f of the building’s roofs. 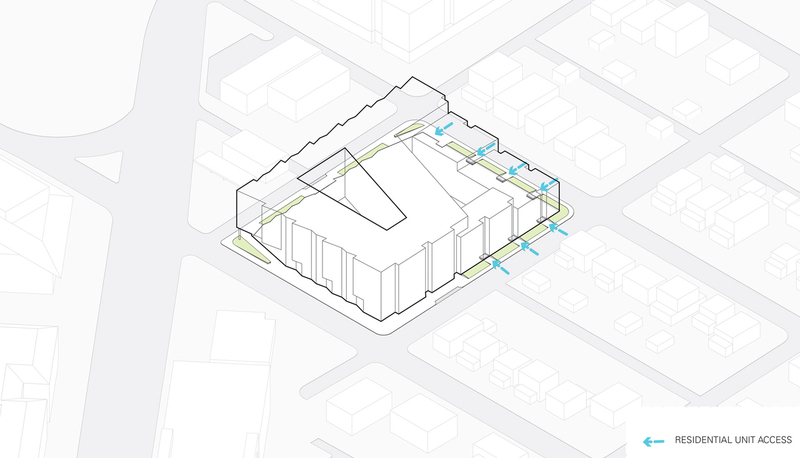 Gale’s Annex, originally built in 1997, required a full replacement of 13,000 s.f. of roofing across the building’s two roof levels. 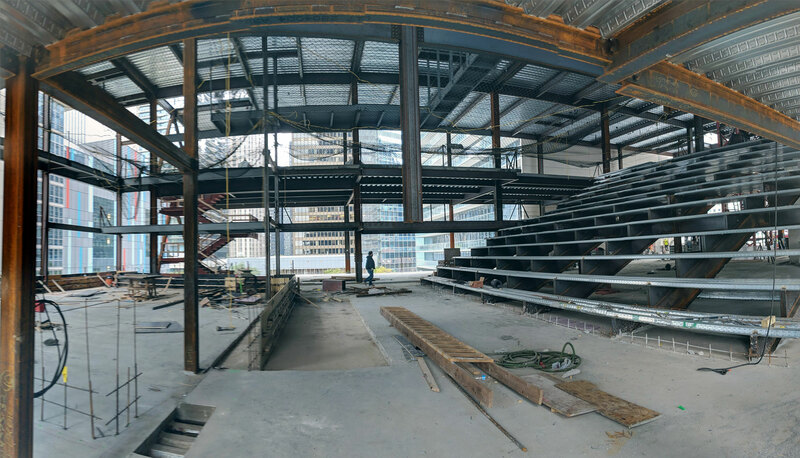 As increased insulation was necessary to meet the current energy code, bKL collaborated with structural and mechanical engineers to address new loading requirements and existing roof top equipment. Modifications to chiller support bracing, masonry walls and parapets were made to improve flashing and joint details.